While sorting through papers, I found this postcard. ... anyone else had lots of weather this month ? I've only ever been on I.O.W. once, for a funeral, about 24 yrs ago. I was dressed as Dangermouse. And its still raining here in Ryde on the IOW! Lawn is saturated. Longing to get out and tidy up my beds a bit but just no point trying at the moment! Roll on spring! I hope you soon get some sunshine in Ryde ! No two days the same here , rainy and 8C today , yesterday , cold windy 3.5C ; I think that the white stuff is forecast in North Norfolk tomorrow . A proper pattern would be welcome ! Never mind Tt , a chance to do some sorting out . yes I don't mind indoor tasks. My pets are great company as I work . ... I'm forging ahead with tidying lots of paperwork ..
We didn't have any weather here today. So, you had no weather at all ? 'Today there will be no weather' .Lol. I hope the sun shines for you tomorrow TT. .rain...................rain..................rain................rain.....................rain....................rain..............and so fed up, garden is like pudden. Thanks for the weather updates folks ..
or too much 'wet look' clothing ? I'm thinking that an investment in a souwester like the card would be a good idea! TT - Descending? Persisting? Over-indulgent? Excessive? ... precipitating ? persevering ? percolating ? Higgle d piggle d lost my leg where by not by the garden shed by the puddles so deep I could dip a sheep. The river by me has flooded the nature walk, awaiting the canal to go next, then I ll be just one of Andrews that will p*ssed off. That's good Terra, it's already a treasure! GoYers perhaps overdosing on the cold remedies ? Having to dry my washing over the radiators, nowadays, Terra, since a combi-boiler was put in a couple of years ago. Wastes money, takes ages to run a bath and longer to heat up the flat. Where am I? What's going on? Who are you? And what are those pink elephants doing, floating in the garden? Love the way this thread is going Terra! Ah ... the I.o.Wight with the countryside and the sea and the peace and tranquillity ... can you tell I love it there ... lol! Blue sky, bitterly cold wind and sunshine so the towels are blowing dry outdoors for a change ... hooray! What are those floating pink elephants doing ? I can see a rainbow.....not really the suns gone in! Hi Pam ... song ? ... or can you remember 1967 ? yes... lots of rain in most parts of the UK. It's spitting - everybody in! I well remember "Flowers in the Rain" Tt , I also remember "Singing in the Rain" , when it was first released , in 1953 or 1954 , I loved Gene Kelly . He didn't mind the rain , Pam ! 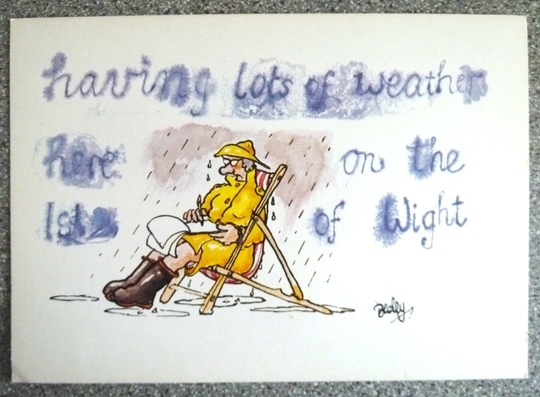 Trouble is Terra, the 'lots of weather' is just rain, rain and more rain down here - just like the postcard in fact!!! I would use my umbrella if only the wind wasn't 'quite' so strong!!! certainly 'lots of weather' ! ... 'Sunshine after the Rain' ! 'Raining in my Heart'? Buddy Holly. 'You are my Sunshine' ? Doris Day. "I Can't Stand the Rain". First sung by Ann Peebles, but I remember the disco version from the 70s. You remember the disco version from the 70's ? TT - I'm much older than I look. Too much gardening and healthy living! Love the post card. No rain here today but oh! So cold outside, luverly and warm in here though....lol. My first memories of the garden was at the age of 3 and collecting snails to keep fenced in between ours and next doors steps. I was upset because someone 'stole' them overnight.!!! At such a young age you found an efficient way to make snails disappear ... ? My first memory of flowers were a neighbour's marigolds, which were covered in blackfly. I didn't know that at the time, but who can forget marigolds and wee black flies? Johnny Ray , singing "The Day That The Rain Came Down", was a big "hit" in the fifties , I remember , it was very dramatic . I remember being on the allotment with my dad , who must have been having to baby-sit , and he disturbed a nest of mice . My first memory of gardening . There was also a strong smell of , what I now know to be , comfrey liquid manure . Some of my earliest memories of flowers are of grape hyacinths and aubrieta ... and I have plenty of both in my gardens today ! Tomorrow, with gales in the forecast, we might be singing a different Doris Day recording .. 'Windy City' ! Must do a runner, before some broad strings me up! Me that started this thread? Gosh, how did that happen? Lol. A bit feeble , but "Stormy Weather" ( with vengeance) ! Memories are made of this, I was there when the sky juice was falling. 'Isn't this a lovely day to be caught in the rain' ! wind and rain here ... someone put out a recycling box yesterday - I know because it all ended up sprread across my drive and front garden! How about "Pennies from Heaven". Dino is under-rated , Mouldy , isn't he ? Tell me about it, Driad! It's raining, it's pouring, the old man is snoring. I'm gonna hit him in the head if he doesn't shut up cos I've gotta get up in the morning!!! Wow ... lots more interesting titles .. Does this one count as a weather song ... ? 'Love is all around us' by WET WET WET !! Get's my vote, but I'm probably biased. Lol. and films, too - Waders of the Lost Ark? Politically correct to use a Mac ...? Rainy days and Mondays always get me down.....Carpenters? Put the boot in, why don't you? Snigr. I'm not sure if its an ark we're building or if we're running away to sea! BA should forget a sailship, then and get a slaveship. Anon...'Michael Row The Boat Ashore'. I lived on the Isle of Wight for 17 years then we moved to Derbyshire. The island was a bit different then and there were fewer ferries. We went on holiday last year there and some of the roads are just as bad as when we used to live there. We knew Alum Bay without all the built up touristy bits and Blackgang Chine had a small Dinosaur park but a lot has been washed away now as it's clay cliffs and the weather has taken it's toll. or IT'S RAINING MEN by the Weathergirls. My wee fat mum adored him, 'til she eventually met him. Brusque to the point of rudeness and make-up couldn't hide the evidence of acne or smallpox scars all over his face. Mum was so disappointed! Lol. She'd put him on a pedestal, so couldn't see his clay feet. Brian Ferry...'A Hard Rain's Gonna Fall'. Have we had Adam Faith ( I think) Raining in my Heart ? Actually , don't look now , but it might have stopped for a while (say nothing). I think that was by Buddy Holly, Driad. Riders on the Storm...The Doors. The mud , mud is just about right , Tt . I remembered it was Buddy Holly , Mouldy , later , but I knew that you would spot the deliberate mistake . Only a couple of light showers as yet today , Andrew . Not light here Driad. Flippin' heavy ones, although not as bad as recently. Keeping me on my toes, eh, Driad? LOL. Just drizzle, here, today...so far! 'Mother, Sweet Mother of Mine'. Can't recall the original singer, but Jimmy Osmond covered it. Chrysanthemum should be the word on here , Tt . A lovely mild day here , no rain (so far). That sounds like it ought to be up there with Molly Malone , Mouldy . Tt will know . 'Mother, Sweet Mother of Mine' - Neil Reid. I hated it at the time, and it hasn't improved with time!! I've heard people being less than complimentary about IoW, so it's good to know it's there for something positive!